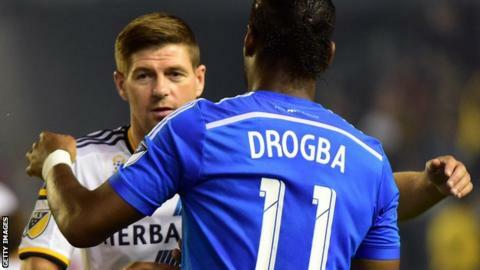 LA Galaxy midfielder and former Liverpool and England captain Steven Gerrard says he may retire in 2016. The 35-year-old joined Galaxy in July after making 710 appearances for the Reds over 17 years, scoring 186 goals. Galaxy were knocked out of the Major League Soccer play-offs by Seattle Sounders last week. "It could be my last season as a footballer. I certainly don't want to feel like I'm feeling right now come next year," Gerrard said. "I'd love to go out on a high. It's a long season and I only came here for the last four months, but I'll certainly be better for the experience next year." Gerrard scored twice in 14 appearances for Galaxy after joining the club over halfway through the 2015 MLS season. He is due to return to England this week where he will work as a TV pundit before heading back to Los Angeles for pre-season training in January. Gerrard, who won 114 England caps before retiring from international football after the 2014 World Cup, says he found some aspects of playing in the United States difficult. "Going on the road, playing on [artificial] turf, playing at altitude, playing in humidity, those are the hurdles that I've had to face over the last three months that I wasn't aware of. Every away game has a different challenge," he said.